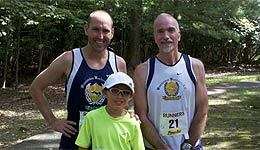 Race Report by Doug Dubrosky – On Saturday 9/4 three Wanderers competed in the Nolde Forest 10K Trail “Chase”. This race is called a “chase” because of the staggered starting times based on age groups. Older age groups (and the very youngest) were given head starts. The faster age groups had to chase them down. It turned out that there were individuals from 7 different age groups represented in the top 10 finishers so it really did work out as intended. The weather was sunny with a cool breeze and made for ideal running conditions. Nolde Forest is a gorgeous private nature park near Reading which doesn’t get used for any other trail races. Like most of the Reading races this one had its fair share of hills and technical single track. That didn’t slow the Wanderers though. Randy Clever finished an amazing 5th place OVERALL. 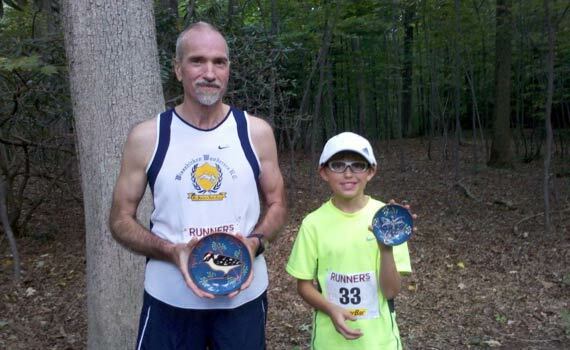 Seth Dubrosky (1st place age group) passed dozens of older runners on his way to a 21st place finish overall. Doug Dubrosky (2nd place age group) finished in 43rd place. Seth and Randy got beautiful awards from Nolde Forest Pottery. All three Wanderers walked away with technical running hats and raffle winnings – socks, chocolates, and gift certificates. Put this Pagoda Pacers-organized race on your calendar next year for sure. 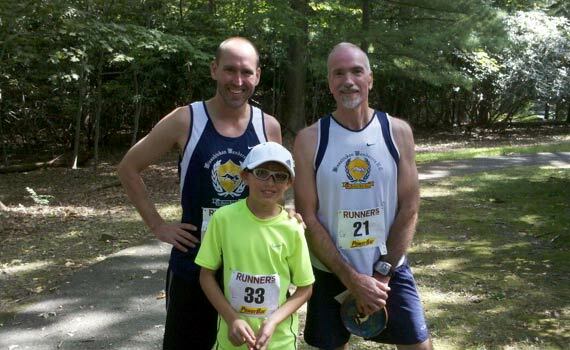 The Wanderers will have a similar (but shorter) age-group staggered start trail race this Thursday evening 9/9 at Valley Green starting at 6:30PM.